Thank you for supporting Wayne State College. 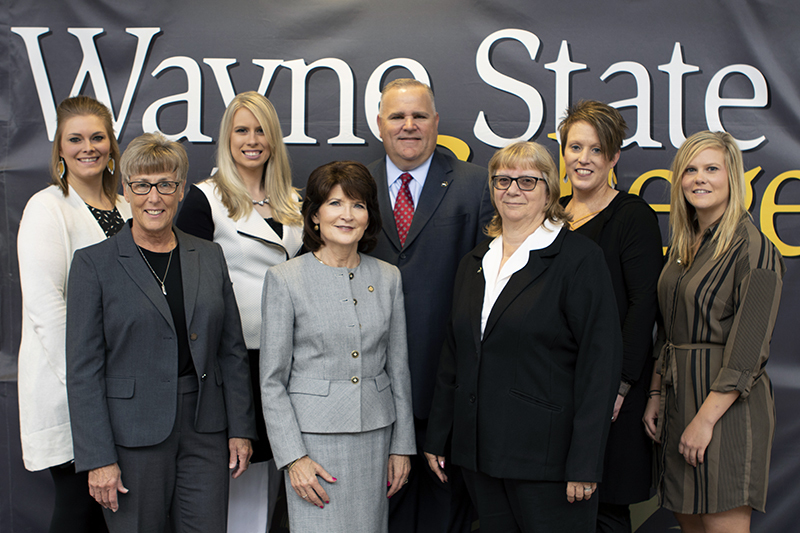 Gifts and donations are gladly welcome to help the Wayne State Foundation continue its support. With our secure online form, you can easily make a gift to the college or its athletic programs. Instructions: Please select a project below that you would like to donate to, or you can make a general donation. Please include any specific instructions for your donation within the "Description" field of the online form. Join Friends of the Arts Club and support cultural events at Wayne State College. The School of Arts and Humanities is dedicated to nurturing student creativity through learning opportunities in word, image, gesture and sound. Your membership in the Friends of the Arts Club assists us in this endeavor. Your annual contribution of $200 will support student scholarships and facility improvements in the current academic year and beyond. Friends of the Arts members enjoy: VIP parking; a tax deduction; recognition on our website and in printed programs; and special email announcements of upcoming events. Dr. Ralph Barclay, a friend, coach, teacher, and mentor to thousands of Wayne State College students, passed away on July 2, 2018. After Dr. Barclay’s passing, one of his former student-athletes pledged to match up to $25,000 for all donations directed to the Ralph and Ann Barclay Athletic Scholarship Fund. Please join us in supporting Dr. Barclay’s legacy before the matching gift deadline of Nov. 30. For 25 years, Dr. Cornell Runestad was the director of choral activities at Wayne State, beginning in 1970 and retiring in 1995. For a time, he was Head of the Division of Fine Arts. His Wayne State choral groups made eight trips to Europe during his tenure, singing in such venues as the Notre Dame in Paris, Westminster Abbey in London, the Thomaskirche in Leipzig, Germany, St. Peter’s in Rome, and the Mozarteum in Salzburg, Austria. His last concert was at Carnegie Hall in May 1995. In June 1965, he married Diana Rogovin in Kenosha, Wisc., and they had two sons. Cornell is survived by those two sons, Kurt (Carly) of Lincoln, Neb., and their children Avery and Owen; and Eric (Anna) of Decorah, Iowa, and their children Ella and Leo. He is also survived by sisters-in-law Jane Runestad and Joan Foreman. After 19 years of marriage, he was preceded in death by the love of his life, Diana, who died of breast cancer in 1984. Dr. Gwen Jensen worked for Wayne State College at various times on a part-time basis from 1996-2002. She was hired as a full-time faculty member Aug. 23, 2002. She retired May 10, 2017. Memorials may be directed to Wayne State College Drama or the Nebraska State Park System. She is survived by her children, Billie D. Davie of Ankeny, Iowa, and Chad (Carrie) Jensen of Norfolk, Neb. ; two granddaughters, Ocn. Phoenix Brown and Kili Addisyn Davie of Ankeny, Iowa; her siblings, Dale (Sandy) Preston of Wayne, Lynn (Bill) Kramer of Wayne, Verl Preston of Buffalo, N.Y., and Neal (Anita) Preston of Atlanta; numerous cousins, nieces, and nephews. She was preceded in death by her parents and a great-nephew, Alex Preston. Teams include baseball, men's and women's basketball, men's and women's cross country, football, women's soccer, softball, men's and women's track and field, and volleyball. The CAT Club’s main purpose is to provide a platform for alumni and friends of Wildcat Athletics to provide contributions to the Wildcat Student-Athlete Scholarship Fund which supports all 13 of the Wildcat Athletic teams. As tuition and operating costs rise, financial contributions are more important than ever. Proceeds from the CAT Club support student-athlete scholarships but also fund a complete student-athlete experience. Show your pride and support Wayne State College Athletics by joining the CAT Club. Membership levels and benefits are listed below. The ultimate benefit is knowing you are joining a team with the goal of promoting Wildcat student-athlete success! Your gift makes a difference in the lives of our student-athletes. Please select the program you would like to donate to. The Adopt-A-Player program is an annual campaign to raise much-needed funds for all 13 of our varsity athletic programs. Please know that your donation makes a difference as you help provide educational and athletic opportunities to the student-athletes here at Wayne State College. The success of this fundraising program is vital to assisting with success of our coaches and student-athletes. We hope you will consider a tax-deductible gift to this very important initiative as we sincerely appreciate and welcome gifts of all sizes as a part of this program. Have a question about the Foundation, its projects, or donating to Wayne State College?